One still unidentified suspect was also arrested at the University of California, Santa Cruz property. Santa Clara County sheriff’s deputies eradicated an illegal marijuana grow, arrested a suspect and seized a stolen assault rifle from a University of California, Santa Cruz property on Friday. In all, deputies were able to remove 4,700 plants and recover a firearm that had been stolen from Sacramento and was loaded with steel rip rounds, Sgt. James Jensen said. Officials flew over the grow in a helicopter and spotted the illegal activity from the air, he said. 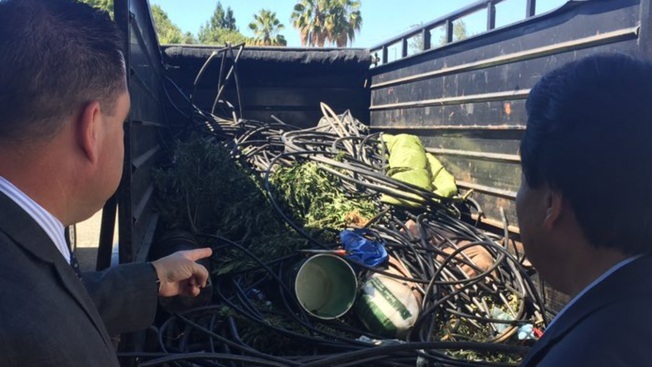 "It’s a different color green, plus all the garbage laid out, so our deputies were able to see it and they responded and were able to get the marijuana out," Jensen said. "It’s a safety issue for those who walk through the property." The sheriff’s Marijuana Eradication Team has conducted five other such operations this year and has seized more than 28,350 marijuana plants, with an estimated street value of $33 million, according to police. The investigations targeted illegal grows that violate state laws about the use and possession of medicinal marijuana, police said. Suspects use local, state and UC Santa Cruz property for marijuana grow, according to Jensen. "It’s horrible damage," he said. "They take the water. Marijuana needs a lot of water to grow and all the fertilizer and pollution, and they leave their garbage there." People with information about illegal marijuana grows can call (408) 808-4420.